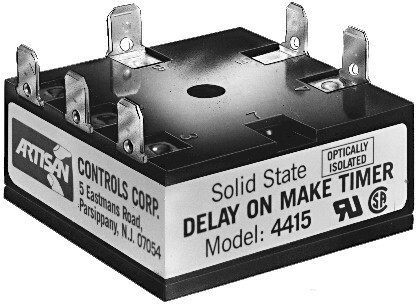 The model 4415 is a delay on make timer that provides AC or DC control of AC load circuits. Optical isolation between the input control voltage and output load voltage permits input control to be different from the output load voltage. When the control voltage is applied, the model 4415 remains in the OFF state permitting only leakage current to flow through the load circuit. When the preset timing period has elapsed, the timer switches ON permitting full load current to flow. The load circuit will remain energized for as long as the control voltage remains applied. Operating Voltage 5, 12, 24, 48V DC or 24, 48, 115, 230V AC 50 / 60 Hz.